Does this mean that people with vitiligo lose pigmentation under the nails, too? That I cannot tell you for sure, but I would think that the answer is yes. i was under the impression that he bleached his skin so that he could even the patches due to the vitiligo. That could be a possibility...but I doubt it. I couldn't get the first photo to come up. The second photo is too far away and low resolution to determine if the color is the same. I have vitilgo. It has completly covered both hands and other parts of my body. The skin under my fingernails have remained pink though. No change. I am white. I don't know if that makes a difference. I live in So. Cal and know the dermatologist who examined Michael for the State of California some years ago when he was being examined for allegations of child molestation. Michael does indeed have Vitaligo according to this doctor. The only reason my doc friend was able to disclose this is because Michael himself has said he has this condition. This is not the extent of Michael's medical conditions but this is all my friend could disclose. This being said, I think the skin bleaching is an attempt to appear "normal" by elimiating the patches. I have never seen a black person with black fingernails. Are your nails tan? Everyone’s nails, palms and soles are pink. 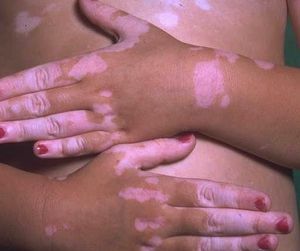 Severe vitiligo can affect the whole body and people do die from it. As a doctor you should know over the counter lighters are not strong enough to "bleach" the body. Darkened nails occur from disease, mal nutrition, chemical intervention if he is lightening his body as opposed to wearing lighter make to blend in the patches or chemotherapy. Severe vitiligo can affect the whole body and people do die from it. Where did you get that information??? Wow! What false things being said. Yes, vitiligo can affect MOST of the body. People have it at varying degress. Those with severe vitiligo get a prescription from a dermatologist for a cream which will permanently depigment all skin - which is What he did. Of course, he was unable to put the cream below his nails. A doctor should know this!!! Dr is it tuinonrue michael bleached his skin with hidroqe at 20%?, i mean thats kinda too much! surgery or some thing else to turning white (actually for the cure of vitiligo).One thing is important that the vitiligo is a serious disease and desearved to research upon it. I love MJ and I'm sure he did something to even out his skin. He lived in the spotlight, he couldn't go around to different colors! I understand why he lightened his skin, I know he had vitiligo, but my question is, why did he get that dimple in his chin! That was just ugly! He was certainly a beautiful man before all the surgeries! That awful face lift sometime after the year 2000, plus that chin dimple thing just did it for me. How could surgeons allow people to continue with crap like that!? GREED! But if I were a surgeon, I would not be the one messing up what is already BEAUTIFUL!! !